19900 ST.RT. 739 Marysville, OH 43040, U.S.A. Address: 19210 Van Ness Avenue, Torrance, California 90501, U.S.A. Address: 700 Clover Road, Lincoln Alabama, 35096, U.S.A. Address: 1070 Honda Way, Timmonsville, South Carolina 29161, U.S.A. Address: 2740 North Michigan Avenue, Greensburg, Indiana 47240, U.S.A.
in Torrance, California, 2 employees, and first year sales of $17,000. Other major agricultural products soon included livestock, soybeans, and non-grain feed such as haycubes. included which are re-alloyed for use in Honda engines and other components. in Honda’s factories in Japan. Paper products and wastepaper exports from the U.S. began. fresh produce and processed food items. Implemented the steel raw material supply system (RMSS) to support Honda of America Manufacturing (HAM). wooden pallets generated by HAM. as well as other HTA offices. 20th anniversary. 60 employees with annual consolidated sales of over $500 million. Import of KD child parts from Japan shifted from HM to HT Group, under Direct Supply System (DSS). in majority interest from AHM to Honda Trading Corporation (Japan). Added Aluminum to the Raw Materials Supply System. 25th anniversary—84 employees with annual consolidated sales approaching $1 billion. Added Plastic and Steel Bar to the Raw Materials Supply System. Parts Division began export of KD Parts globally. HTA establishes KD exports to 14 countries by developing joint systems with HAM and AHM. Added steel tube to the Raw Materials Supply System. Honda Power Equipment and Honda of South Carolina, Mfg. Manufacturing of Alabama and Honda Precision Parts of Georgia. Catalytic Converter - PGM Recycling began. Export of components to Mexico in support of Honda Service Parts production. Established the Machinery and Die Division. Added Magnesium busines to the RMSS. 35th anniversary. $3.5 billion sales, over 300 associates. Large-scale contract manufacturing agreement established with Mexican part maker for engine components. 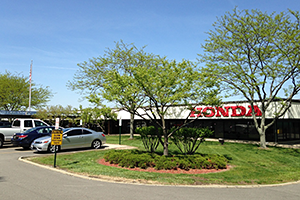 HTA established its Indiana office in Greensburg primarily to support Honda Manufacturing of Indiana. In 2009, the logos from all regions were consolidated to strengthen the brand and unify companies globally. 40th Anniversary of Honda Trading America, $4 billion sales, over 400 associates. Platinum Group Metals Global Centralized Purchasing System began. "Our associates come from a variety of backgrounds and cultures. They are skilled at communication, creative problem solving, decision-making, planning, organization and technical expertise. Each associate is a valued member of the team, and remains flexible in assuming a variety of work assignments. For career opportunities at Honda Trading America Corporation please contact the URL below. "At Honda Trading America we are innovators. For 45 years, we have been exceeding customer expectations by promptly and innovatively linking materials and resources in an ever-changing, global market. We are proud of how far we’ve come, and excited for the future."